Queens and nucs are available in very limited quantities through June; please call or email to inquire. Please note our new email address: tessarnold@gmail.com. Remember, we begin receiving orders in December for the following spring, so order early next season! To go directly to our printable order form, click on the link below. You will need the free Adobe Acrobat reader available here. Having problems? Email us and we will send you an order form. If you are a beekeeper (or a potential beekeeper) and want to buy queens, nucs or complete hives, click here. You can also buy honey, pollen, and other apiary products. We also build custom observation hives and copper hive roofs to order. If you are a grower (large or small) interested in increasing your yield, visit our pollination section. 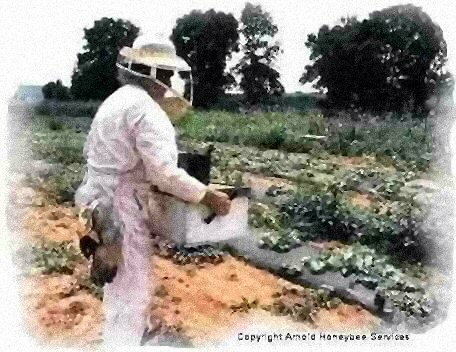 If you have a honeybee infestation, read about our bee removal service. And don’t forget to check our informative FAQ section! INTERESTED IN LEARNING MORE ABOUT BEEKEEPING?